For all of us health conscious folks, eating enough vegetables and getting all of our daily nutrients is always on our to-do list. Our busy lifestyles can make cooking fresh meals a challenge, which is why Otamot tomato sauce is a pantry must-have. This very versatile sauce can be used to whip up a variety of recipes, and all you need to add is a few fresh ingredients. I’m hesitant to even call it a sauce because it’s so much more than what you typically expect in a tomato based sauce. It has a rich and hearty texture, and the savory flavor really goes above and beyond any other sauce in a jar I’ve tried. It’s incredibly nutrient dense with plant-based nutrition from 10 vegetables and healthy oils, making it a super food! Normally I wouldn’t even consider making a soup recipe from a sauce, but that’s how great this product is! 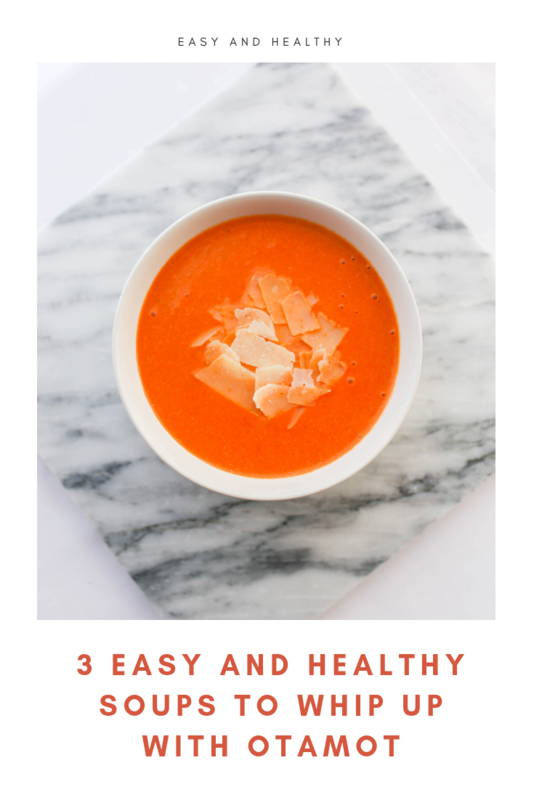 Below I’ve outline how I made three separate soup recipes using Otamot tomato sauce, each one healthy and simple to put together. Beans - could be kidney, garbanzo or white bean. 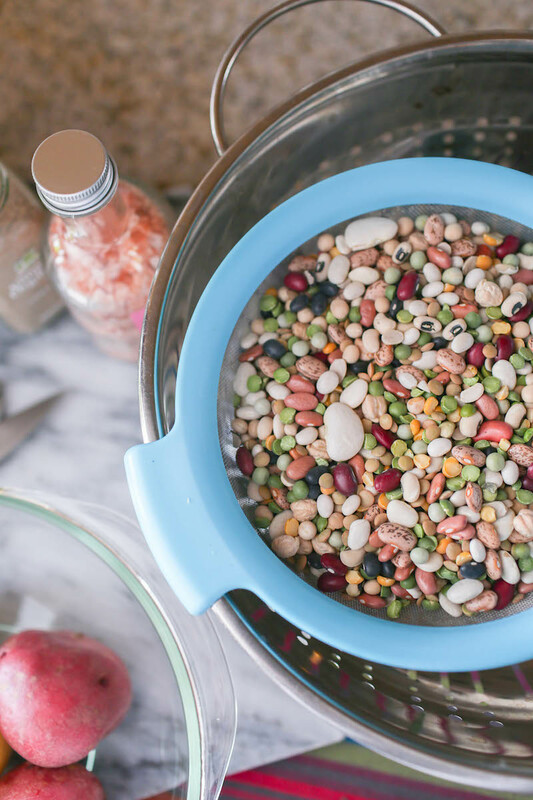 You can used cooked beans from a can or cook beans in your crockpot prior to beginning the recipe. Potatos - cubed. I personally prefer Yukan Gold Potatoes and Red Potatoes. They have the most flavor and cook very tender. Any other vegetables you have in the fridge. 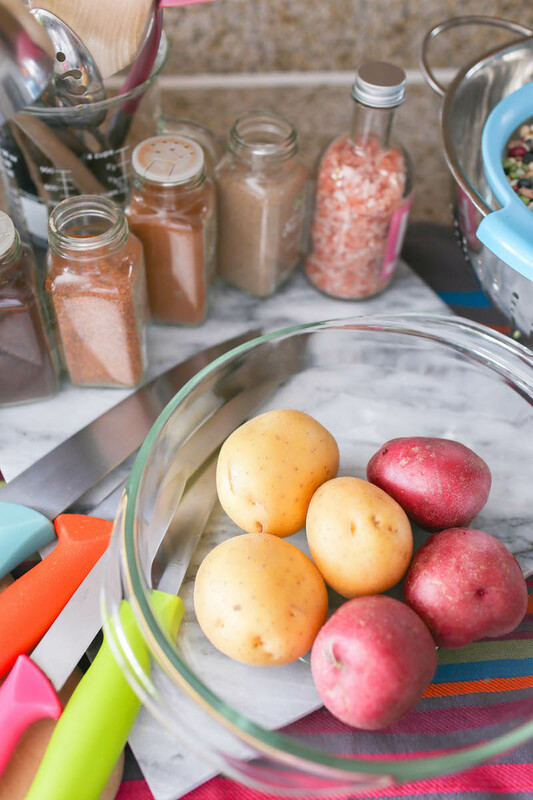 The beauty of this recipe is it helps you avoid food waste by being able to add in all kinds of foods. You can even substitute the pasta for rice. You’ll notice that I didn’t put measuring amounts in the ingredients list. That’s because often when I cook I don’t measure, I just go with the amounts and proportions that I like. If you prefer a heartier soup, you can add more of the beans, pasta and veggies. I also didn’t add any spices because you honestly don’t need them when you’re cooking with the Otamot tomato sauce. I would actually advise against adding any seasoning until you’ll had a change to try it fully cooked with Otamot, I’m fairly certain the only thing you’d want to add is a little salt. For myself when I was cooking this soup, first I cooked the beans in my crockpot the day prior. Before I put the beans in the crock pot, I sorted through to remove any rocks and debris and soaked them in hot water for an hour. When you are ready to put them in the crock pot, for every one cup of beans I put two cups of water. I also add whole garlic cloves and a halved onion to the pot. I set on high for 2 hours and then on low for another 3 hours. Be sure to keep checking on the water level and tenderness of your beans. 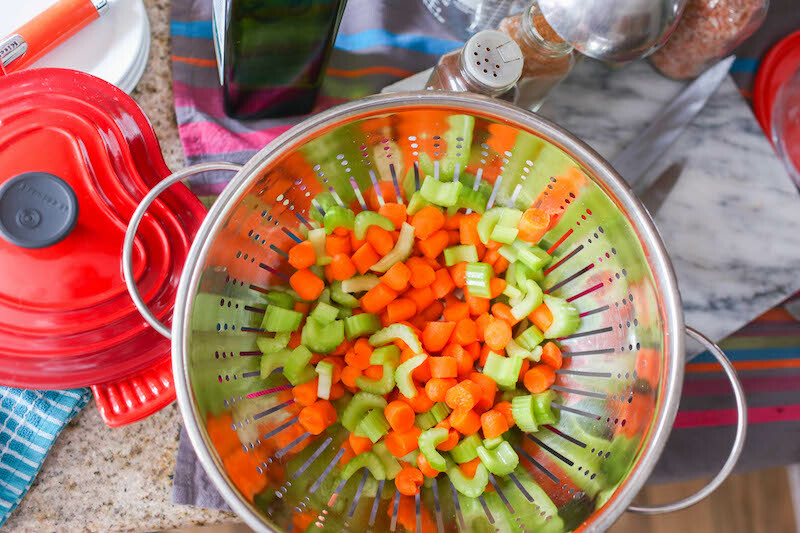 With your more hearty vegetables like the carrots and celery, I cook them first because it takes a little longer to soften them up. I put them in my crockpot with some broth and put on high for one hour, and then low for 2 hours. I added the potatoes and cooked for another hour. The pasta I cooked on the stove, just follow the instructions for traditional pasta. I generally just do two parts water for every one part of pasta. Drain and set aside. Add all your cooked vegetables, beans and pasta into an extra large pot and now it’s time to add in your sauce and broth. For every one cup of Otamot tomato sauce you will add a cup and a half of broth. You can add the broth you used in the crockpot to cook your vegetables. Keep adding the sauce and broth until you achieve your desired consistency. I cooked a large batch and then froze half of it to enjoy another time. This soup recipe freezes well, be sure to use an air-tight glass container to avoid freezer burn. This recipe is so simple but still so delicious and creamy! In a large pot put one cup of Otamot tomato sauce and one cup whole milk. Put on medium heat until it begins to simmer and reduce to low heat. You don’t need to keep it on the stove very long, just until the liquids have fully mixed and are heated through. 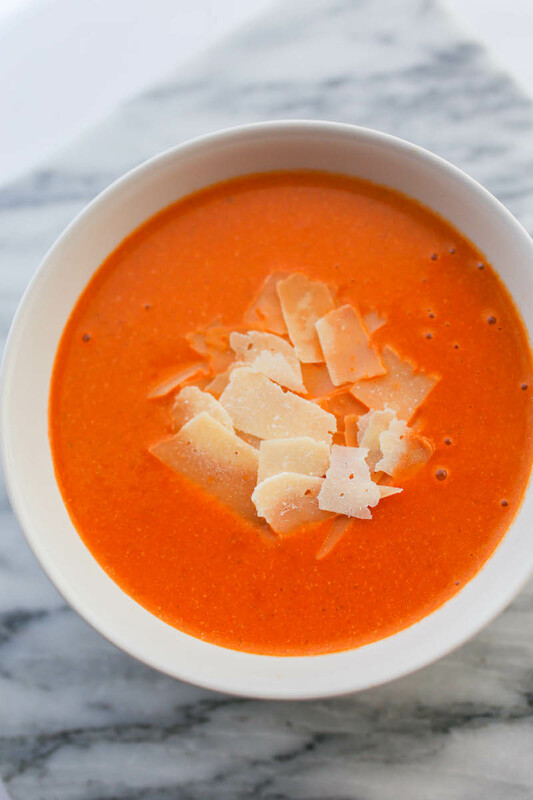 Top with freshly grated Parmesan cheese and voilà, it’s ready to serve! Your local health food store may carry this pre-mixed uncooked dried bean mix. It’s also commonly called Fiesta Bean Mix. You can also substitute any dried beans found in the bulk foods isle at your grocery store. Similar to the directions for cooking beans in the Minestrone Soup recipe, sort through the dried beans to remove any rocks and debris and soak them in hot water for an hour. In the crock pot, for every one cup of beans put two cups of water. 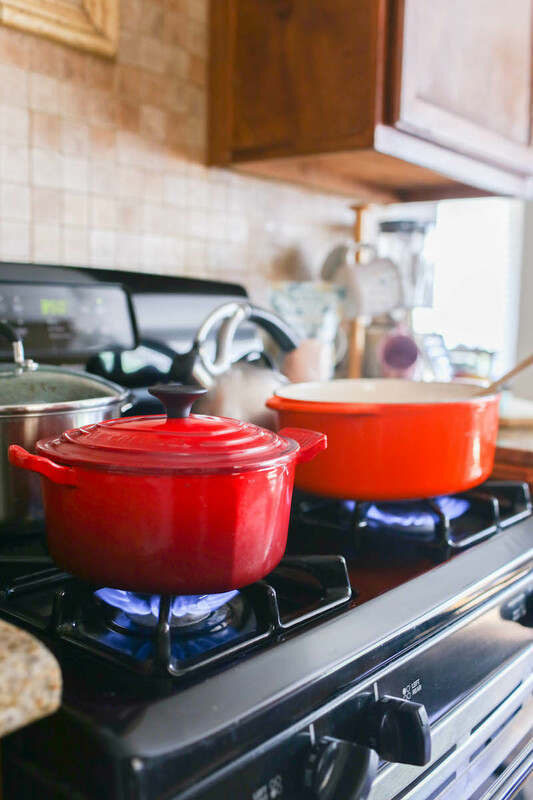 You can also use a traditional cast iron pot, just be sure to cover it and keep the beans covered with water. Add whole garlic cloves and a halved onion to the pot. Set on high for 2 hours and then on low for another 3 hours. Be sure to keep checking on the water level and tenderness of your beans. Make sure not to overcook them because you will be simmering them with the sauce. After your beans have cooked, drain them and add to a large pot. Mix in the sauce and broth, one and a half cups of broth to every one cup of sauce. Stir and simmer until the liquids are completely even distributed and heated all the way through. Then it should be ready to serve up! This soup freezes well if you decide to make a large batch.